Careful building orientation and design allows daylighting to provide significant contributions not only in office areas, but warehouse spaces as well. Light-guiding blinds, coupled with strategically placed windows and skylights, bring daylight deep onto the building and provide an abundance of diffuse, low-glare lighting. Augmenting the daylight is an electric lighting system consisting primarily of high-performance, T8 fluorescent lamps with dimming ballasts controlled by Watt Stopper daylighting controls. Photosensors constantly monitor outdoor lighting levels and controllers automatically adjust the fluorescent lighting to maintain the desired ambient levels. A multi-zone control strategy is used in the office areas so that fixtures closest to the windows dim first as daylight contribution increases. Additional energy savings are achieved by using occupancy sensors throughout the building and grounds to ensure that lights are not on unless the space is in use. Most are set with the manual-ON option selected in order to maximize energy savings. October daylight in NRG offices. Carefully directed daylight and dimmable fluorescent lighting combine to provide optimal lighting levels whenever the space is occupied. Sensors prevent any energy waste. Passive infrared, ultrasonic and dual technology sensors have been installed according to the size and function of each space. Dual technology sensors, advantageous for applications not ideally suited to either PIR or ultrasonic technology alone, are used in several offices and a large board room. This approach ensures the greatest sensitivity and coverage with the least threat of false triggers. Both technologies must detect occupancy before the sensor turns the lighting on, but continued sensing by just one technology will hold the lighting on. Special weatherproof sensors are used for outdoor areas and are rated for temperatures from -40° to 130° Fahrenheit. Vermont can deliver some brisk temperatures! The spaces using natural lighting employ sensors along with the daylighting controls to maximize energy savings while at the same time helping NRG Systems keep its commitment to being a good neighbor. Community residents also benefit from the sensors as they reduce light pollution from the skylights after dark. NRG Systems’ electric lighting primarily uses high-performance T8 lamps combined with programmed start electronic ballasts for maximum light output and long life. Low, normal, and high-output ballasts were specified for different spaces to customize the light output appropriately and squeeze every possible Watt out of the lighting operation. While this approach sounds simple, it complicated the design and construction processes. Multiple fixture tags were required for each basic fixture type, baffling suppliers who didn’t understand the ballast differences, and submittal reviews became complicated. Additionally, the contractor had to be careful about putting identical-looking fixtures in specific rooms. Downlights, wall sconces, and decorative pendants primarily use 32W compact fluorescent lamps. Limiting the number of lamp types on the project simplifies maintenance and allows owner to economize by purchasing replacement lamps in volume. When asked whether the lighting and controls systems performed perfectly right away, the designers responded, “No. There were a few compatibility issues that had to be resolved and required getting the luminaire manufacturer, ballast manufacturer, lamp manufacturer and the controls manufacturer involved in a conversation with us and the owner’s electronics guru.” After taking field measurements, observing the behavior of the system and waiting for laboratory test results, Shapiro and Miller discovered that certain fixtures specified with a single three-lamp ballast had been shipped with a single-lamp and a two-lamp ballast and the added current draw of having two ballasts per fixture was overloading the system. Additionally, the lamps provided were not compatible with the ballasts, so the fixtures had to be reballasted to resolve these problems. The designers also discovered a misunderstanding about the standard operation of the daylighting controller, which they intended to have switch lights off on bright sunny days. Once the desired operation was communicated to engineers at Watt Stopper/Legrand, they were able to provide instructions on how to re-wire the controller to produce the desired results. All of this careful attention to detail resulted in a lighting design that was estimated to use about one third of the energy of a typical new custom building. 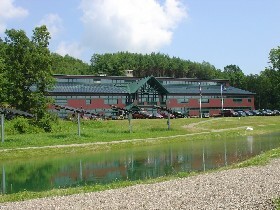 The connected lighting load for the building is a scant 0.77W/sf – over 46% less than ASHRAE/IESNA 90.1-2001 allowances. Continual energy monitoring has proven the benefit of the control strategy and actual daytime lighting energy use is over 40% less than the connected load, even in winter months. Actual electricity usage by lighting was very close to expectations, consuming 40,000 kWh from March 2005 through February 2006. The building is one of only a handful of manufacturing facilities to earn a LEED Gold certification. NRG Systems also succeeded in its goal of using low cost energy and is supplying 72% of the energy used from renewable sources, which include solar, wind and wood pellets. 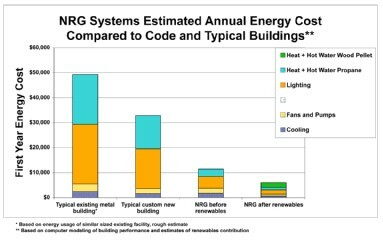 NRG Systems limited energy use in all aspects of its building operations. The lighting uses about 1/3 the energy as that of a typical new custom building.